• HDMI stands for High Definition Multimedia Interface. It is a direct digital connection that can carry digital HD video as well as digital multi-channel audio. By eliminating the conversion to analogue signals it delivers perfect picture and sound quality, completely free from noise. HDMI is fully backwards-compatible with DVI (Digital Video Interface). • Simply plug your device into the USB port on your Philips DVD system. Your digital music and photos will be played directly from the device. Now you can share your favourite moments with family and friends. • MP3 Line-in uses Plug and Play technology that allows direct playback of MP3 content via the home theatre system by simply plugging your portable MP3 player into the built-in headphone jack. 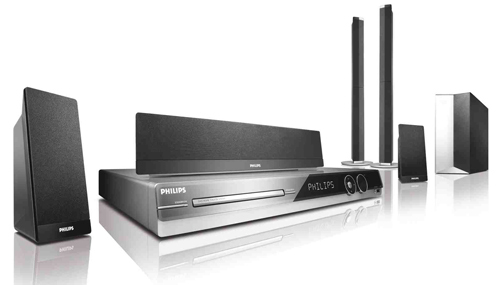 Now you can enjoy the superb sound quality of the Philips Home Theatre System while playing your favourite music from your portable MP3 player. • DivX Ultra combines DivX playback with great features like integrated subtitles, multiple audio languages, multiple tracks and menus into one convenient file format. • Play virtually any disc you want – whether they are CDs, (S)VCDs, DVDs, DVD+R, DVD-R, DVD+RW, DVD-RW or DVD+R DL. Experience unbeatable flexibility and the convenience of playing all your discs on the one device. • Play virtually any media format you want – whether it is DivX, MP3, WMA or JPEG. Experience the unbeatable convenience of great playability, and the luxury of sharing media files on your TV or home theatre system – in the comfort of your living room. • A built-in DTS and Dolby Digital decoder eliminates the need for an external decoder by processing all six channels of audio information to provide a surround sound experience and an astoundingly natural sense of ambience and dynamic realism. Dolby Pro Logic II provides five channels of surround processing from any stereo source. • 12-bit Video DAC is a superior Digital-to-Analogue Converter that preserves every detail of the authentic picture quality. It shows subtle shades and smoother graduation of colours, resulting in a more vibrant and natural picture. The limitations of the standard 10-bit DAC become particularly apparent when it is used with large screens and projectors.